The weather this week in Cincinnati has been downright beautiful. After the couple weeks of overcast and stormy skies, we’ve been blessed with a streak of clear skies with cool mornings and warm afternoons. This feels very much the same as biking in the early spring at the start of this project because the mornings are chilly – between 40 and 55F – but the afternoon warms up to the high 70s. This morning in the park was another pleasantly cool and misty morning. 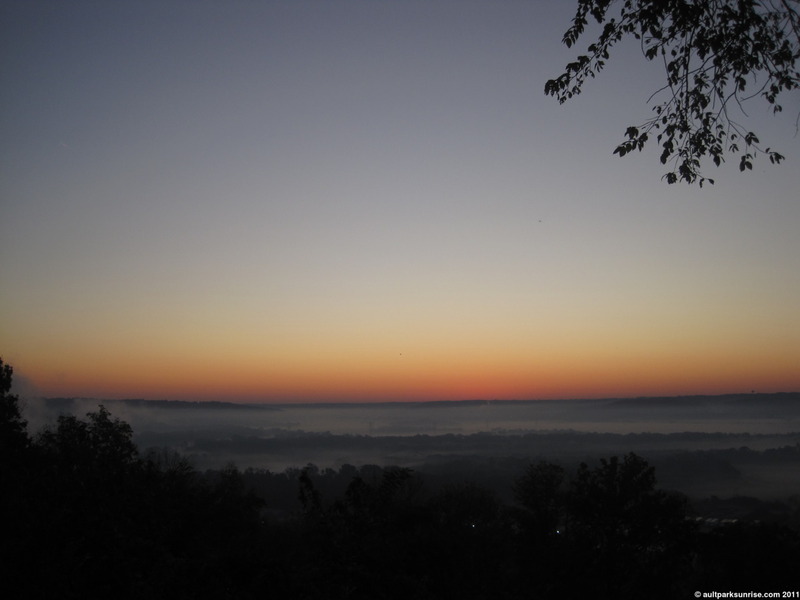 The Cincinnati Fog made an appearance but stayed down in the lower basin of the valley, providing a true clear sky sunrise. 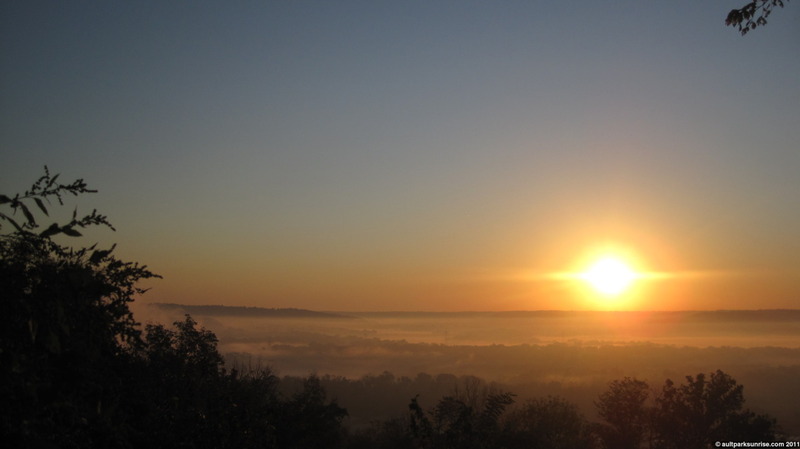 These clear sky sunrises are a beast unto themselves because of how early the sky lights up, and how quickly after sunrise the oranges give way to the bright yellows of a full day sun. 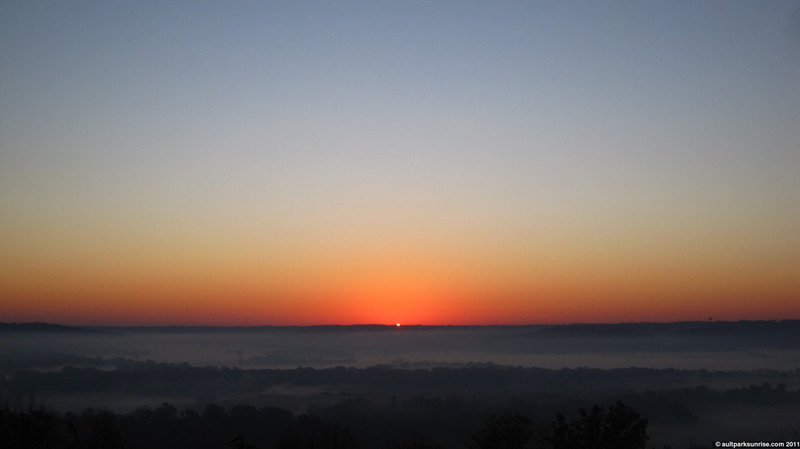 I arrived at the overlook this morning about 15 minutes before sunrise, which is now somewhere beyond 7:40am it seems, and the horizon was already overflowing with a deep orange gradient. I went out in a tshirt this morning, braving the chilly elements. I found that the 45F temperature didn’t bother me as much as I thought. I could have used a light pair of gloves, but overall it wasn’t uncomfortable. The first warm cup of Trader Joe’s medium roast coffee certainly helped. I met Dave and Penny, a gentleman from Mt. Washington and his young golden retriever. 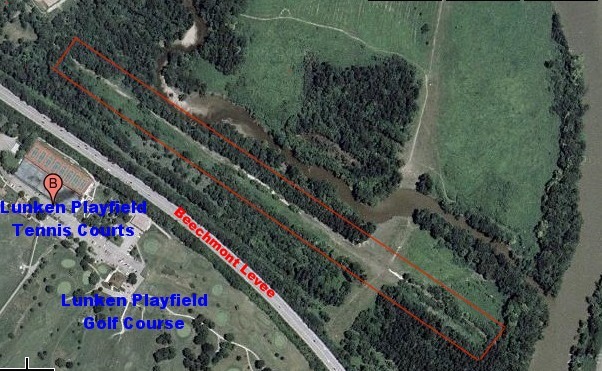 Dave filled in some information about the old drag strip and the beechmont levee. I didn’t actually realize that Beechmont Ave. was built on top of a levee. I know that there is a levee system between Lunken Airfield and the Little Miami River, but what I didn’t realize is that the levee takes a sharp turn and continues toward Mt. Lookout, running between Armleder Park and Lunken Airfield. Dave said that in the 1970s when he originally moved to Mt. Washington, there were no trees on the levee so it was obvious. Now, however, the forest has matured and it is harder to see it. 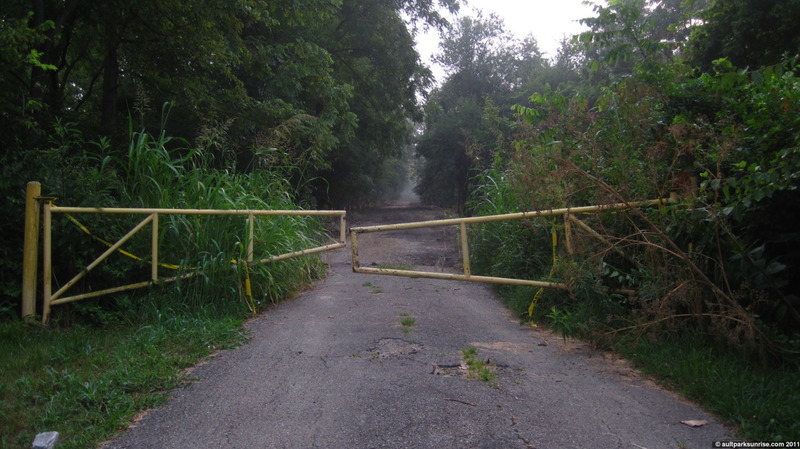 Interestingly, however, Dave mentioned that “Old Beechmont Ave” still exists in pieces at the foot of the levee on the Armleder Park side. That old drag strip that I learned about over the summer utilized the pavement that was once part of old Beechmont. That makes a lot of sense, thanks Dave! One final thing before I post the few pictures from this morning’s sunrise. 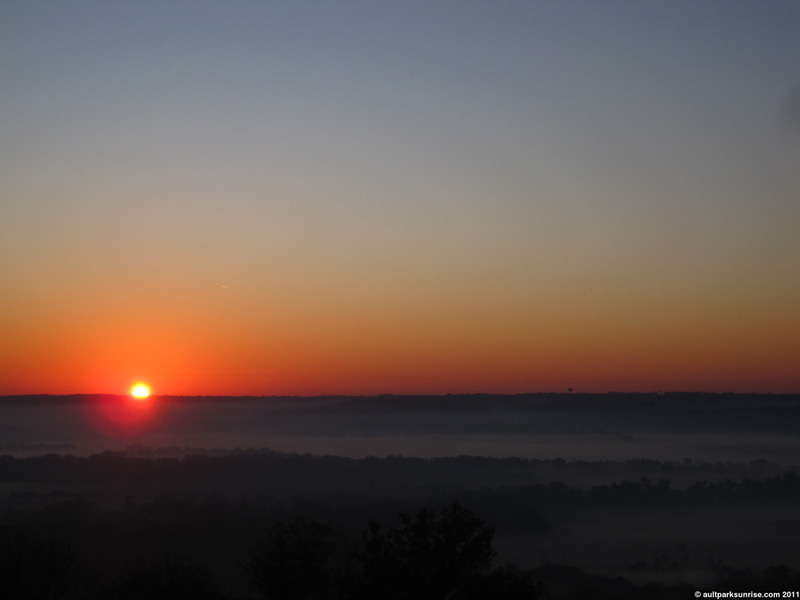 I have a new idea for a focus for the remainder of this Autumn’s sunrise posts. As the Cincinnati forests change their coats into their autumn shades, I’m finding myself picking out patterns in the tree-lined background to my morning rides. Just as I observed the various species of trees break out into bloom in a well syncronized seasonal change into spring, I’m noticing the many local species of trees that are changing colors (or even blooming) together while their green brethren hold out until they are ready. I’d like to focus on a specific species of tree for a morning and find all the locations in the neighborhood where this tree has found a home. In the forest, in yards, and placed in the park and the city boulevards by the park service. One specific tree that has piqued my interest has been the ash tree. After talking with Aaron the horticultural, who takes care of the gardens at Ault Park, about the ash beetle’s western-moving front across the region and the defensive (but inevitably futile) measures they’ve implemented in the park, I’m finding myself seeking out local ash trees if for no other reason than to create a memory of a tree that my grand children may very well not know in their lifetimes as a native tree. They’re also known for their beautiful fall display, and I find it sad because many of the ash trees that I’ve found so far seem dull and withering. It is apparently of high probability that most of the trees I’ve seen so far are already infected with the beetle and there are no known ways to cure the tree. The only thing that can be done is give the tree a treatment that merely prolongs the life of the tree a few more years. Apparently Mt. Washington has already lost most of their ash trees, and western Cincinnati are just starting to receive their first positive contact reports :(. Interestingly enough, Ault Park has become a test ground where each ash tree is treated with a different anti-beetle program. Hopefully one of them is successful and can be used to save the trees that have not yet been infected. Along the boulevards along the major residential roads that connect to Ault Park there is an interesting happening. Principio Ave is lined with fading ash trees, something I never realized until I picked them out this morning. I spoke with a local woman about the trees, and she told me something interesting. A few years back the city removed many of the ash trees because they were already dead or almost dead. The ones that remain today were the strongest, but they won’t last much longer. But what I find interesting is that this spring the city planted new young trees in place of the lost ash. You can find them all around the neighborhoods because their young trunks are still protected by white plastic so that the local population of hungry deer don’t get to them. I believe they are a kind of maple, but I didn’t check them out in detail (yet). I’m mentioning this because I am curious about what kind of tree is going to replace the ash tree in our local neighborhoods and boulevards, and also why the ash tree was chosen in the first place? I imagine there are many things that a city planner has to think about when designing a neighborhood’s arbor makeup. The ash trees do seem like a perfect size – large enough to be magnificent, colorful in the autumn, but not so large as to rip up sidewalk and otherwise be destructive. That’s much more than I expected to cover regarding the ash tree, so when I do the “ash tree sunrise” in the next week, there may be a bit of repetition. Oh well, I’ll consider that a rough draft. I’ve mentioned previously that every autumn I notice this specific species of maple that explodes in this bright orange hue, but only for three or four days. I’ve still got my eye out. 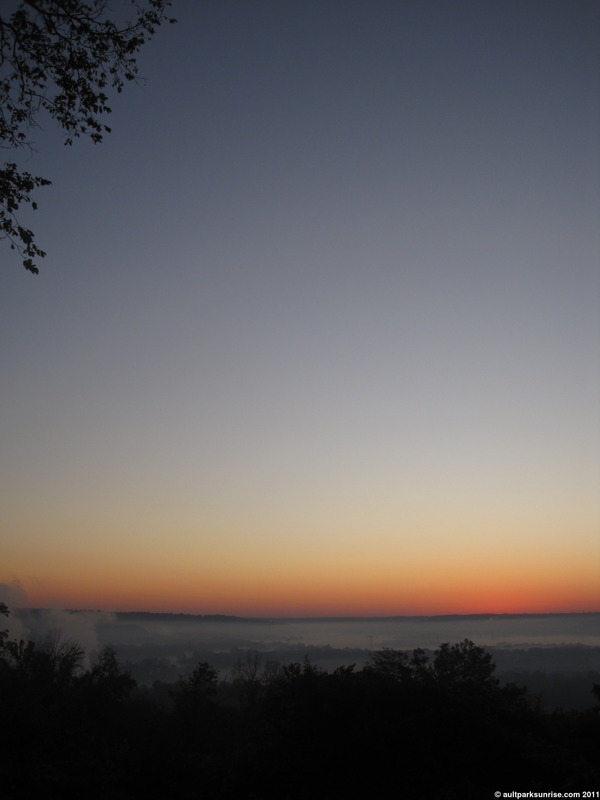 The dawn at Heekin Overlook. Roughly 15 minutes before sunrise. 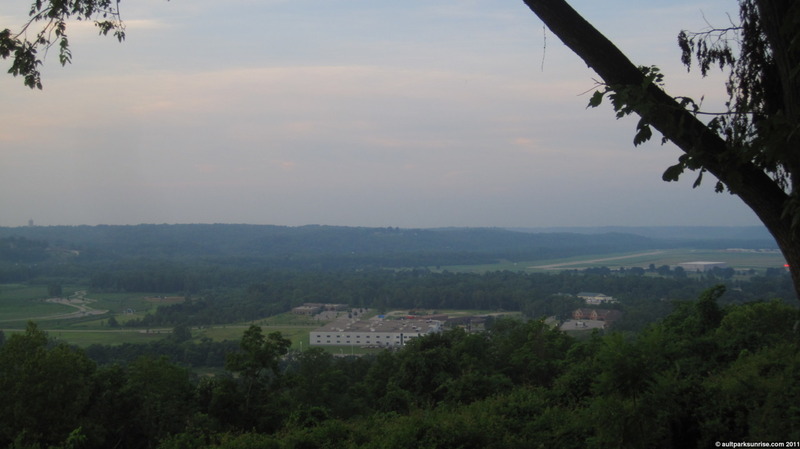 Looking over Lunken Airfield towards the Ohio River. 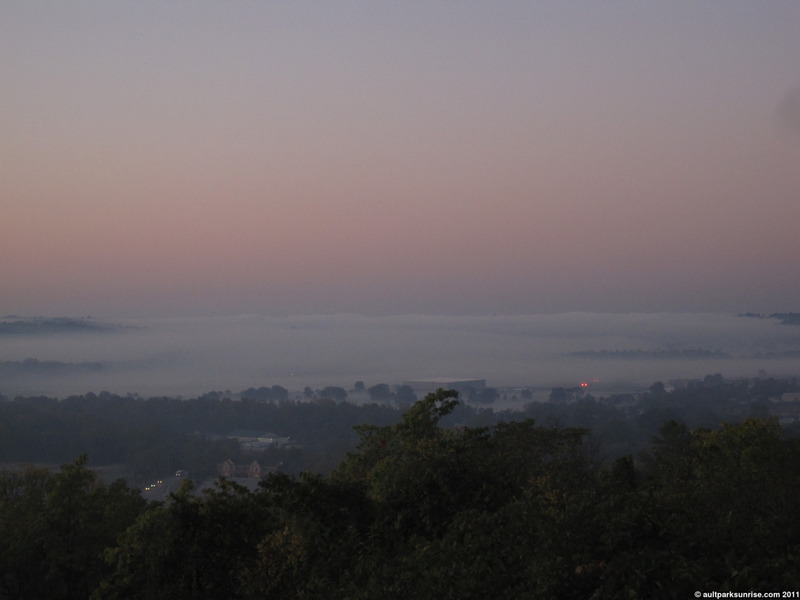 See that giant plume of fog in the far background? That’s the Ohio River! The fog just piles on high in the air above the water. 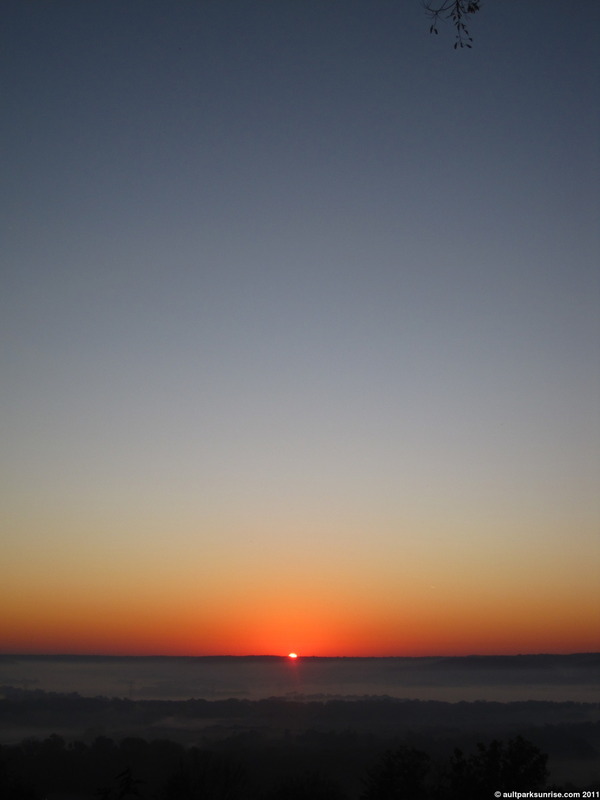 A vertical shot encapsulating more of the orange->blue gradient of the sky. 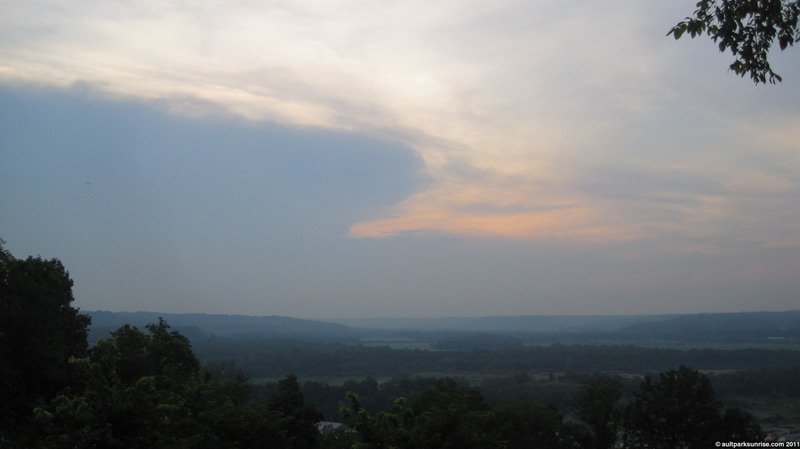 A closer view that shows the layers of forest and farmland buried in the mist. See what I mean? In about 10 minutes the orange sunrise is gone and the sun takes a full-on yellow look. This is in drastic contrast to days like Sunrise 101 where the high humidity can make a sunrise last for an hour or longer. In this sense I’m defining a sunrise duration as the amount of time it takes for the light to cycle from deep purple to orange to yellow. This is relative to where the viewer is standing, of course. 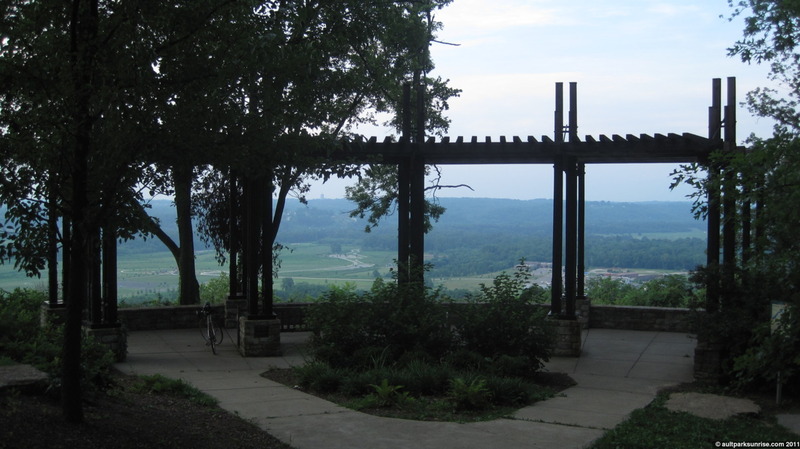 I noticed that the third and final missing bench in Heekin Overlook has been replaced. 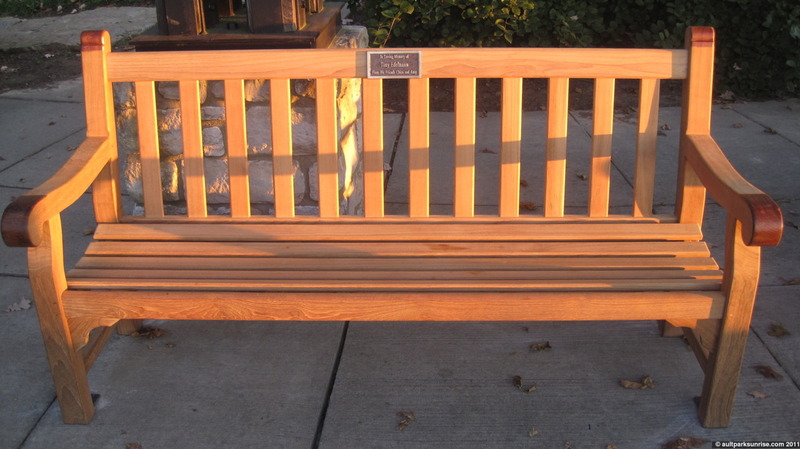 I learned from Dave that the wood that these benches are made out of is a rain-forest hardwood called “teak“. Teak wood is valued as being water resistant and historically has been used for creating ships. And there you go!